Manhattan, by Gascoigne Designs, offers a beautifully classic, deep filled seating option boasting clean lines and sumptuous cushions, for the most comfortable and stylish seating option available. With elegantly scrolled arms and charming wooden, bun feet, each sofa adds a classy character to traditional or modern style homes. Available with a standard back for a more conservative appearance, or as a pillow back for voluptuous comfort, Manhattan is sure to suit a variety of homes. Crafted with a durable hardwood frame and full coil sprung unit, each sofa is guaranteed comfort to last. Combined with the foam and fibre mix cushions help to provide the best in comfort and support whilst relaxing. This is further aided by the duck feather filled, complimentary scatter cushions on the standard back sofa, or the cushions with the pillow back. 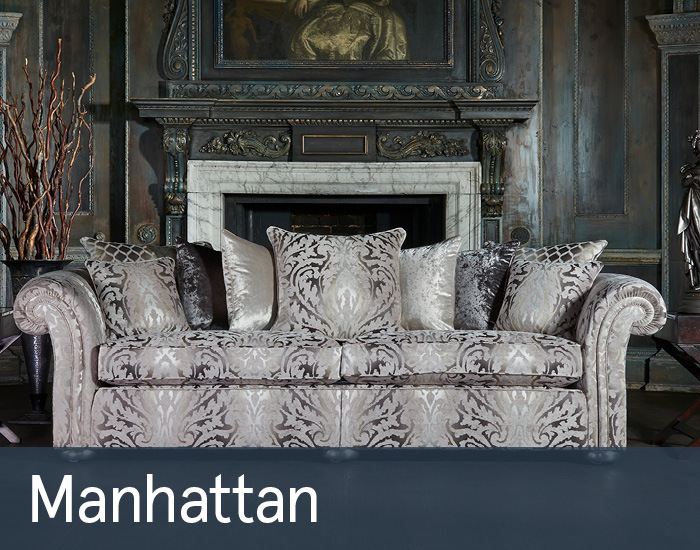 Upholstered in quality classic style fabrics, the Manhattan is a perfect example of traditional elegance.